It is wise to have a normal user in your image. If you don't then you should create one and save the image. That way the source files can be opened from a normal user on your host - you won't need to launch your IDE with root privileges. I wanted to learn Django. Installing Django is commonly made with the package manager pip, but pip has a bad history of breaking up things since it doesn't communicate with Debian's apt. So at some point if you installed/uninstalled python stuff with apt, pip wouldn't know about it and vice versa. In the end you would end up with a broken python environment. That's why a tool called virtualenv is being used - a tool that provides isolation. 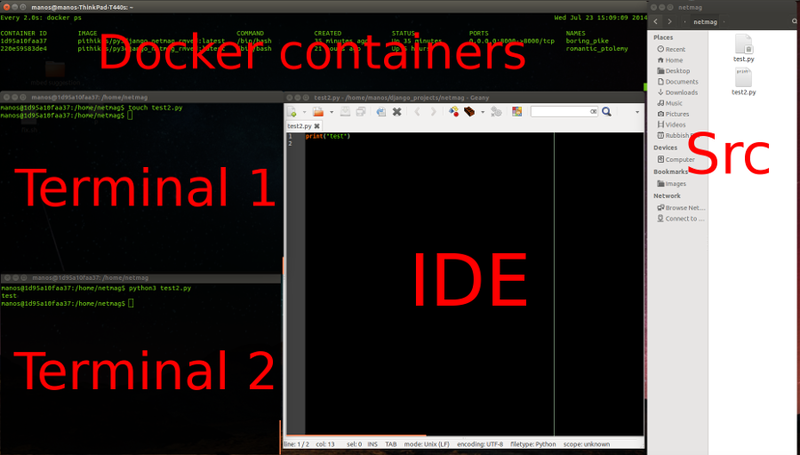 Since we have docker though which also provides isolation we can simply use that. I assume you have an image with django and python installed. Let's call the image py3django. The flag -p makes sure that docker doesn't choose a random port for us. Since we run Django we will want to run a web server with a fixed port (on 8000). The flag -v mounts our host folder /home/manos/django_projects/myblog to the container's folder /home/myblog. py3django is the image I have. Now all this is very nice but admittedly it's very complex and it will be impossible to remember all these commands and boring to type them each single day. Therefore I suggest you create a BASH script that initiates the whole thing. echo " Stop any other instances of this container"
echo " if they are running and try again." echo " To reproduce the error, run the below:"
You can combine this with devilspie, an other nice tool that automates the position and size of windows when they're launched. I use this because I personally like having an overview on the running containers. That way I don't end up with trillions of forgotten containers that eat up my system. So as an intern in a big company I was given the task to get comfortable with docker. The problem is that docker is quite fresh so there isn't really that much of good tutorials out there. After reading a bunch of articles and sparse tutorials (even taken the official tutorial at https://www.docker.com/tryit), I still straggled to get a firm grip on what docker even is supposed to be used for. Therefore I decided to make this tutorial for a total beginner like me. Docker simply put is a replacement for virtual machines. I will use virtual box as a comparison example since it's very easy for anyone to download and try to see the differences themselves. Each and every of the OSes you see in the picture above, is an installed virtual machines. Each such machine has it's own installed OS, kernel, virtual devices like hard disks, network cards etc. All this takes a considerate amount of memory and needs extra processing power. 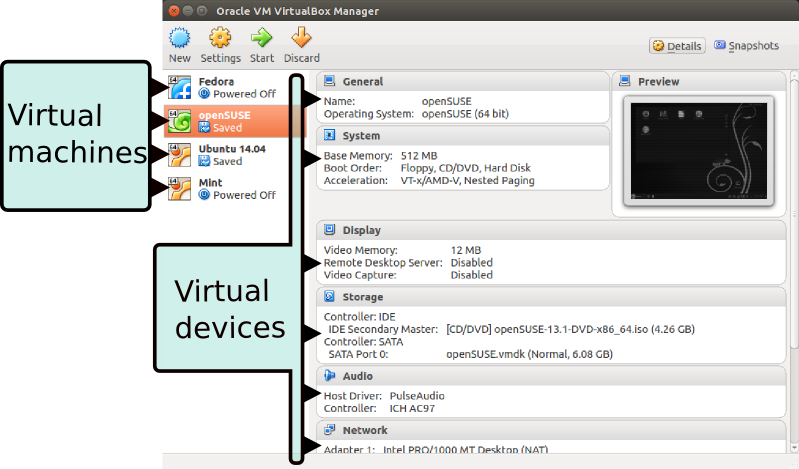 All virtual machines (VM) like VMware, Parallels, behave the same. 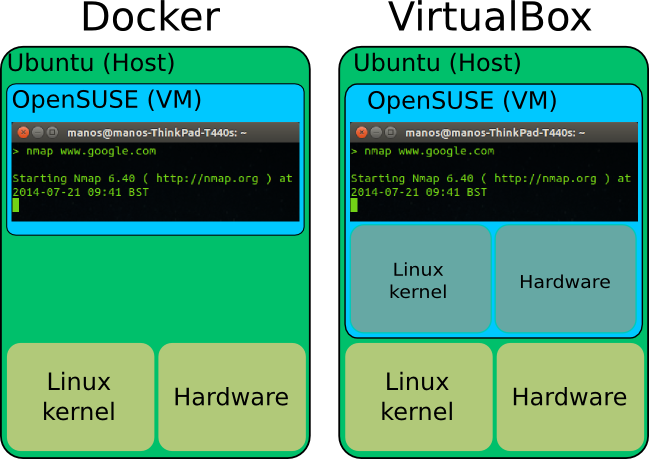 In contrast to VirtualBox or any other virtual machine, Docker doesn't install the whole OS. Instead it uses the kernel and hardware of our primary computer (the host). This makes Docker to virtualize super fast and consume only a fraction of the memory we would else need. See the benefits? Imagine if we wanted to run 4 different programs on 4 different OSes. That would take at a minimum 2GB of RAM. But why would you want to run nmap on openSUSE instead of the host computer? Well this was just a silly example. There are other examples that prove the importance of a tool like Docker. Imagine that you're a developer and you want to test your program on 10 different distributions for example. Or maybe you are the server administrator on a company and just updated your web server but the update broke something. No problem, you can run your web server virtualized on the older system version. Or maybe you want to run a web service in a quarantine for security reasons. As you see there are loads of different uses. One question might rise though: how do we separate each "virtual machine" from the rest of the stuff on our computer? Docker solves this with different kernel (and non-kernel) mechanisms. We don't have to bother about them though, since Docker takes hands of everything for us. That's the beauty of it afterall: simplicity. In our scenario we want to virtualize an Arch machine. On VirtualBox, we would download the Arch .iso file and go through the installation process. In Docker we download a "fixed" image from a central server. There are thousands of different such image files. You can even upload your own image as you will see later. This will download a default image for Arch Linux. "base/arch" is the identifier for the Arch Linux image. See how the command prompt changed? 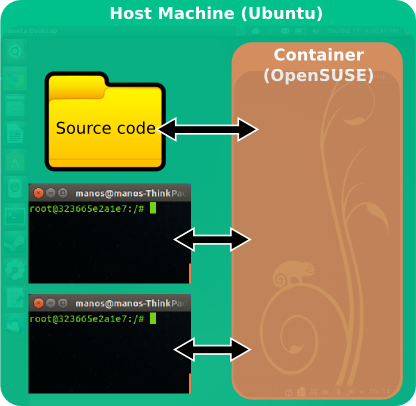 Now we are inside the image (virtual machine) running a bash instance. In docker jargon we are actually inside a container. The string 8109626c57f5 is the ID of the container. You don't need to know much about that now. Just pay attention to how we acquired that ID, you will need it. Now you probably got a good idea on what images are. Images are simply states of a "virtual machine". Here I ran two instances of the ping command. First I pinged www.google.com and then www.yahoo.com. I had to stop them both with CTRL-Z to get back to the terminal. Notice that I don't have to write the whole string. For example instead of 7c44887b2b1c, I just type the first three letters 7c4. In most cases this will suffice.